Hi, I’m Luke Hughes project lead On Burden of Command. Our two minute teaser video focused heavily on RPG aspects. But what about tactical combat?! While tactical details are still being worked out, today I can give you a high level impression by pointing to inspirations from cardboard. Hunh? Cardboard? Well IMHO a lot of creativity over the last few decades has come from the physical board game space (a future blog will cover digital influences). I feel privileged to “stand on the shoulders of giants” (well at least crouch). 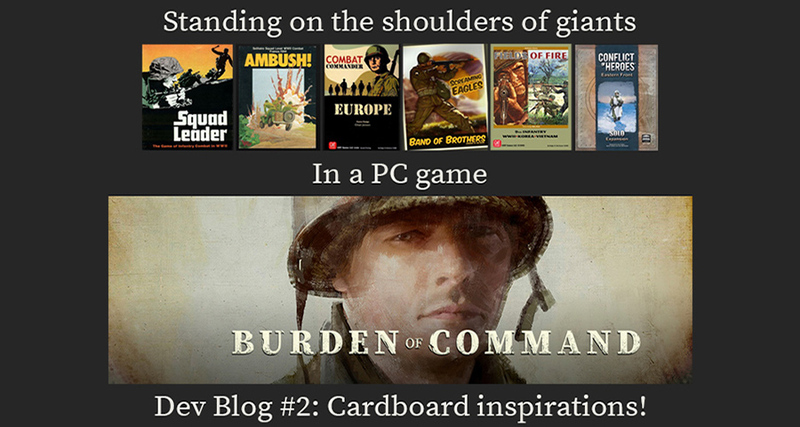 In this blog I will describe those influences and how they shape Burden of Command’s tactical design. The games below are by no means an exhaustive list, there are many other fine designs out there, these are just the ones that have had the most influence on me. Most images below come from the marvelous BoardGameGeek site (check it out!). Squad Leader (1977) is the “ur” WWII tactical game. It spawned the still passionately followed Advanced Squad Leader and deeply influenced most subsequent turn based designs. Mechanically, your fire your squads — their fire ideally enhanced by leaders — at enemies to cause “Morale Checks” which upon failing lead them to be “broken” (ineffective) or even “routed” till rallied by leaders. Random events like machine guns jamming or troops going “berserk” add unexpected drama. Ambush (1983) was perhaps the first true WWII tactical RPG. You control a squad of individual soldiers with RPG like stats (e.g., ‘initiative’ and ‘perception’). Entering specific hexes can triggered narrative and gameplay events (see illustration above). Influence #3: Integrate Narrative: Integrate narrative events directly into tactical gameplay for better immersion. Burden of Command extends this via a more general “StoryTeller Engine” that watches your battle and triggers event not only on entering a hex but also on a variety of other game play occurrences like unit actions (shooting, assaulting etc) and changes (morale checks etc). Influence #4: RPG Creates an Immersive Battlefield: Deepen the experience of battleship leadership by making the player care about your men through classic RPG mechanisms (they persist and gain experience across battles). Making you think twice about sending those sprites (“That’s Dearborn!”) up that hill. In Combat Commander (2006; GMT Games) chaos is pervasive. The actions available to you (move, shoot, rally, etc) are strictly limited to the random cards you have drawn! Even what specific turn the scenario will end on is carefully randomized. A large set of randomly drawn events (e.g., “Sniper!”) spice up gameplay. Influence #5: Pervasive Chaos Creates Depth: Pervasive chaos makes interesting decisions about uncertainty equally pervasive (e.g., “does my opponent have a Fire card left? Will the scenario end this turn?”). Burden of Command will emphasize leadership as a means to manage that chaos (the dreaded “RNG” in digital parlance). Influence #6: And Deeper Emergent Stories: A larger set of random events deepens “emergent storytelling” and adds unexpected “plot” twists and turns in gameplay. 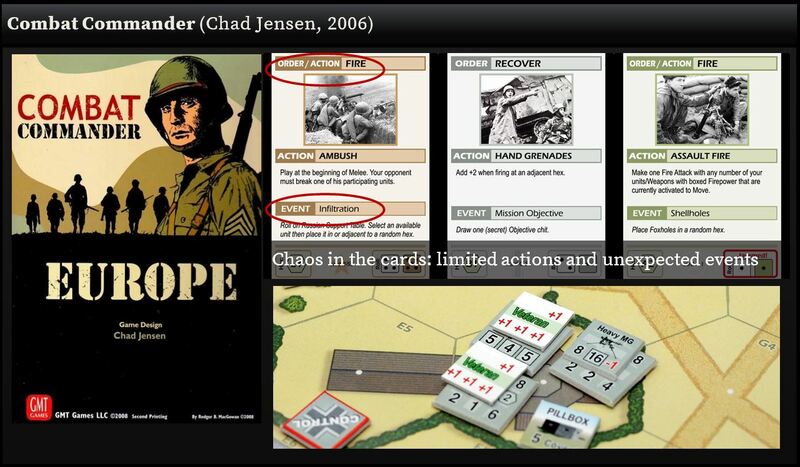 Fields of Fire (2008, GMT Games) designer Ben Hull served in the USMC as an infantry officer and brings that experience to bear in a novel design emphasizing the authentic details of tactical leadership. Leaders receive randomized amounts of Commands to both activate and give squads specific actions (more, fire, rally, take cover etc). Influence #8: Suppression is King: Suppression is a key concept for the psychological battlefield, leading to yet more command and control chaos (will this suppressed unit actually act?). Burden of Command explicitly uses leaders to mitigate the strong effects of suppression. In other words, experienced men who trust and respect your leadership will often overcome their suppression. Influence #9: Gamble on the Battlefield: “Push Your Luck” is a deeply appealing gambling like mechanism and adds yet more chaos (noticing a theme here? 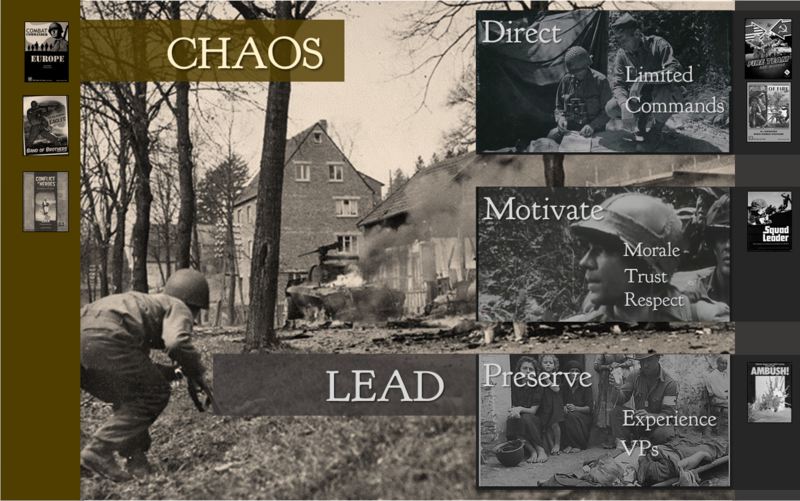 Burden of Command intends to adopt chaos with a vengeance but use leaders to manage and mitigate its effects. Don’t play Burden of Command if you want to be in control, play it if you want to lead in the face of chaos! Chaos makes for interesting decisions and good battlefield emergent stories!). Fire team: Red Eclipse (TBA, Lock n Load Publishing) is a re-design of the original Fire Team game by our scenario lead Steve Overton (“Mad Russian”), who not only served in US Army but is a famed digital game scenario designer (e.g., Combat Mission). Leaders play a pivotal role in the game with their state determining how many commands they can give each impulse during the turn. Influence #10: TBD: Steve’s design has only recently gone public and he has promised me a game when he returns from his current vacation. Given his role in Burden of Command and my deep respect for his talents I am certain Red Eclipse will have a strong influence over the design evolution of Burden of Command. The following illustration summarizes how Burden of Command defines battlefield leadership. In a nutshell, the battlefield is a psychological landscape where Chaos creates interesting decisions (as well as emergent stories) that leadership mitigates through Directing (via an always too scare pool of command), Motivating (leaders influence morale checks, push your luck, suppression and more), and Preserving (RPG like preserving of your valued men across battles as they gain experience and you gain empathy). We would love to hear from you now! What are your favorite board/wargames? Which one of their mechanics you value most, and why? Do you think a particular aspect of modern conflicts has been underrepresented in wargames? And, most importantly, do you really need a formal question to talk about your favorite games? Comments are available, social buttons are below, you know the drill! Never played any RL-inspired/military boardgames. Always felt bored when my friends asked me to play stuff like Civ or Game of Thrones with them. Fallout (GURPS) and The Elder Scrolls based one felt much better though. But now I definitely gotta check if anything from your list can be found in my (forsaken) part of the world. I love boardgames that require Game Master to play, and love to be one. Having some freedom over the course of the game allows helping players get more enjoyment out of it, when the game rules just make them suffer (like, due RNG). You can help emergent storytelling spread its wings, so to say. As a PC wargamer, I’ve noticed something about myself worth mentioning here. When playing, say, Combat Mission, in single player, in turn-based mode, I find myself being unable to deal with casualties (sometimes leading to rage quit). It’s not that I can’t stand my pixeltruppen dying, it’s just that when I see them die following their orders (they act 1 minute on their own, each turn), it often feels like bad AI is messing things up, or just bad luck RNG, it feels really really unfair. Or, sometimes, in big missions, when there’s lots of troops under my command, taking casualties increases the level of C2 chaos that you have to deal with. And, knowing that you play against the AI, who does not get overwhelmed emotionally over such things, I, at that point, feel at a major disadvantage. BUT. When I play PBEMs with other players, it feels completely different. First, it’s not really cool to rage quit a PBEM game. Second, both players are on equal terms, so taking casualties feels fair. In all aspects. Third, going against real opponent, you simply have to… toughen up. So, how do you make a good single player game where you don’t control your troops directly that won’t make you feel unfair/cheated? 2. suppression over casualties – I’m big on the battlefield as being more about firepower generating suppression than casualties (well small arms at least). Therefore, unless you do clever things like run across the open towards an unsuppressed MG (in which case honestly you deserve what you get) then its more about forcing suppression and thereby command chaos on you then you losing men. But of course men are lost. So I don’t want to make things up, BoC consciously makes you feel the pain. Though you also have your leaders to temper the chaos. But you’ll have to decide if you want the possible heightened rage quits!!! The good news is boardgame players of chaos games like Combat Commander, SL, and BoB seem to like it. But then maybe that was the human factor. Great question, no simple answer. BTW great book on psychology of tactical “Brains and Bullets.” I’ve learned immensely from it. 3. bored by realistic boardgames — hmm.. thinking which I would recommend. Well maybe find someone to play Chaos Commander as just the ultimate bath in chaos and yet potentially finding it fun. But while the game gets a lot of praise there are also some haters because of the high degree of chaos. Conflict of heroes is probably your slickest game, and BoB and FoF your most realistic. Thanks for posting, love these conversations. Hope you’ll drop by social media like FB or twitter. Yeah, I love games where suppression matters a lot. And hate the ones without it. Having an AI being affected by it also matters significantly (obviously). What I think would help to deal with psychological impact of taking casualties (as in my case) would be having a strong RPG element that keeps you immersed enough so that you become focused inside the story/situation, and forget you’re going against an AI & RNG. That’s why I think the whole idea of BoC is totally awesome. Oh, I’m sorry, I’ve expressed myself wrong (not English-native). I am not bored by realistic boardgames. On the contrary. I’d like to try them out, it’s just that I’ve never had a chance. Will ask my boardgame playing friend if there’s anything like these around. Thanks for that kindness. If you feel generous please spread the word on FB, Twitter, or whatever works for you. This is a labor of passion not big $$ I’m afraid. Our marketing budget of 0 is already exhausted 🙂 Well I lie a bit the teaser cost me 😉 and we’ll do a let’s play type further video eventually but really I don’t have marketing bucks. So help! We’re on FB and Twitter BTW. Hint. Hey I know this isn’t table top board games, but in terms of managing chaos, constrained choice, and emergent storytelling + persistent units, have you seen “mud and blood 2”? It lacks the deeper empathy mechanic, but it’s still a really well done example. And as for suppression mechanics + building some empathy through storytelling and unique characters, I’m sure you’ve looked at the video game “Brothers in Arms”? And also, for building empathy and training others, the really old video game “Norns”. My first introduction to wargames was Squad Leader, I borrowed it and borrowed it and borrowed it until my neighbor stopped asking for it back. I think I was 10 or 11 at the time. I promptly bought Blitzkrieg and Third Reich. Played against myself for years. Played a few game PBM (no ‘e’) and used stock price lists to determine die rolls. I purchased first edition Ambush and thought it was the coolest game ever. I’m going to have to raid my coworkers’ closets and play the other games listed. I have purchased but only played for an hour, Conflict of Heros in the PC version. One of the first games to provide me with a sense of being a leader was a very eaarly computer aged game in black and white. It was the battle of Napoleon and the battlefield was nodes and lines in a 3D matrix. So you got the concept of hills and valleys and LOS. You could only see the battlefield from the POV of the leader and you had to use runners to send orders to your units. It was a perspective changing experience. Wow first wargame was SL! Well you were marked for life LOL. I remember that Napoleon game I think (wasn’t there a Gettysburg one)? I recall the first Computer Ambush too (though never got a chance to play it). How did you miss Steel Panthers though! 😉 Combat Commander is worth your time if you have not tried. I still have every version of Steel Panthers published on CD and 3.5″ floppies. I also occasionally dust off SPWaW and winSPWW2. I think I owed 75%-80% of all the wargames put out by SSI, SSG, etc during the lifetime of the TRS-80 Color Computer through the Intel 386 era. I’m serious, I bought and played everything I could get my hands on that ran on a computer I had. Moving several times caused me to bleed off my cardboard games. But today I have over 1,000 PC games on steam and a good proportion of the Matrix/Slitherine catalog. It’s nice to see an integration of the best qualities of the aforementioned games. “Which one of their mechanics you value most, and why?” This is the answer I’d like to address because just this week I had the mind-blowing experience of watching several “Decisive Campaigns: Barbarossa” videos (by VR Games). It’s fundamentally another hex & counter theater-level wargame of the Russian front but the magic is adding a political (read human) layer to the game, where your relationship with various persons of influence (generals etc through to Hitler himself) influence the support provided to your army. It seems so well done that it makes the standard board-type wargame seem extremely dry. I’d highly suggest checking out some videos like in this series (the first one interestingly named “Burden of Command”, lol): https://www.youtube.com/watch?v=XkTKlp4gL6g&list=PLev0Msy6nByQKJHfjELCQRY4curCh5CbU&index=1 There are heaps of examples of politics/people decisions in his play-through video series and it really brings the game to life and puts one in the seat of a real commander. Thanks for taking time to post. DCB is amazing! In fact its designer Cameron Harris is a friend of our project. Very smart guy and hats off for being arguably the first to so clearly integrate the human and political into a digital wargame.